Electronics for Artists is a two day course first presented in November 2010 at the Digital Media Centre at South Hill Park in Bracknell.All material and examples are available as open source download here. The first day of the course is a general introduction to electronic components and tries to gives a feel for how circuits work. It provides plenty of opportunity to try experiments on the circuits suggested and should give people enough understanding to feel they can build and modify circuits in future. In the second day of the course we use the Arduino programmable controller to create a simple organ with lighting effects using the electronic skills from day 1. 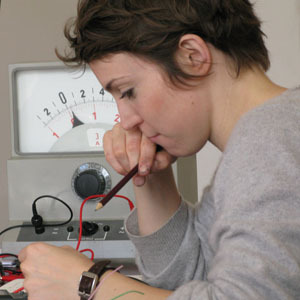 The focus is on techniques that are useful to make interactive installations and can be picked up easily. The course is suitable for people with no past experience in electronics or computer programing. Each stage of the course introduces new ideas that build and develop throughout the day. There are lots of fun circuits ending up with an electronic organ and a chain-light sequencer. Flickr set of photos for the first presentation of the couse. The course notes are licensed under a Creative Commons Attribution-Noncommercial-Share Alike 3.0 Unported License. If you would like me to run the course for your group or organization then please contact me via the guestbook or blog to discuss options. My course to build an Atari Punk Console - an introduction to the more practical side of building electronics. Make also had a very good series of videos about different electronic components. Good refresh for those that have done the course or introduction for those that haven't. The Art of Electronics is the classic text book for those that want to do deep in to the subject without having their head explode! It's packed with information, but is a surprisingly readable. Probably not suitable for absolute beginners though. Buy a copy when you've built a few circuits and want to know what's really going on. Cyclepong is now in the Novelty Automation arcade in Holborn, London.